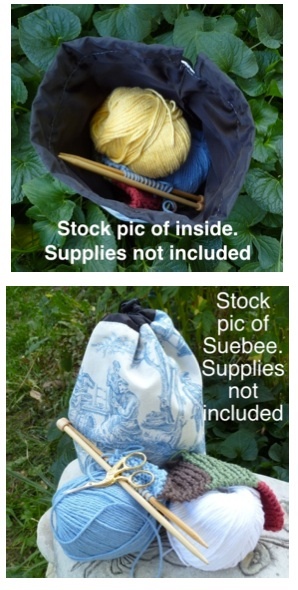 So many uses for this Alice in Wonderland Suebee, a round, flat bottom, drawstring bag. It's great for your small knitting projects, like socks and scarves. Perfect as a bag for playing tile games, such as Rummikub and Scrabble, as it sits up and keeps the tiles in place while the player reaches inside, without seeing the tiles. Use it in your suitcase to organize when heading overseas, or even to carry your balls when going to the local golf course. Customers are telling me the SueBee makes an excellent "going out" bag, and to organize in the bathroom as well. If you need a small project bag, for knitting, with more organizing options, take a look at the Kipster.